Limited Exclusive Pre-Release The debut solo recital album from acclaimed American tenor Michael Spyres. This album includes arias in French and Italian by Donizetti, Berlioz, Verdi and Rossini, as well as duets with Joyce El-Khoury, whose debut recital recording will be released alongside Michael’s. Hailing from Mansfield, Missouri, Michael Sypres originally set out to pursue a career in musicals before singing opera. He comes from a family of musicians who run an opera company in Springfield MO, and after studying in the US, travelled to Europe to complete his studies in Vienna. He has rapidly established a formidable reputation for his sensitive singing and astonishing vocal range, with leading roles a the Royal Opera House Coven Garden, Lyric Theatre Chicago, Opéra de Paris and Aix-en-Provence Festival. In 2017, he appeared as Don José in Carmen in Paris and sang Enée, opposite Joyce DiDonato in Berlioz’s Les Troyens in Strasbourg. Michael starred on the Opera Rara recording of Donizetti’s Les Martyrs, which received a string of awards including Opera Recording of the Year at the International Opera Awards in 2016. He returned to Opera Rara to record Le Duc d’Albe and now we are thrilled to release his debut solo recital album, featuring 19th century repertoire synonymous with the tenor-of-his-day, Gilbert-Louis Duprez. Espoir includes arias in French and Italian by Donizetti, Berlioz, Verdi and Rossini, as well as duets with Joyce El-Khoury, whose debut recital recording will be released alongside Michael’s. The debut solo recital album from acclaimed American tenor Michael Spyres. This album includes arias in French and Italian by Donizetti, Berlioz, Verdi and Rossini, as well as duets with Joyce El-Khoury, whose debut recital recording will be released alongside Michael’s. Das Debüt Solo Recital Album von gefeierten amerikanischen Tenor Michael Spyres. Dieses Album enthält Arien in Französisch und Italienisch von Donizetti, Berlioz, Verdi und Rossini, sowie Duette mit Joyce El-Khoury, deren Debüt-Recital-Aufnahme wird neben Michael’s veröffentlicht werden. L’album debuttante di recital solo da acclamato tenore americano Michael Spyres. Questo album comprende le arie in francese e in italiano di Donizetti, Berlioz, Verdi e Rossini, oltre ai duetti con Joyce El-Khoury, la cui recital debuttante sarà registrata a fianco di Michael. 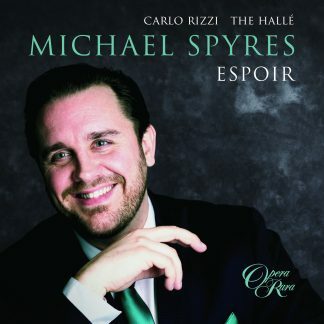 Le premier album de récital solo du tenor américain Michael Spyres. Cet album comprend des arias en français et en italien par Donizetti, Berlioz, Verdi et Rossini, ainsi que des duos avec Joyce El-Khoury, dont le premier album de récital sera diffusé aux côtés de Michael’s.